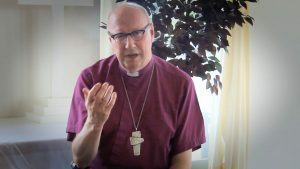 A senior Church of England bishop has lambasted conservative evangelical Christians in the US for their “uncritical support” of Donald Trump, urging them to reflect on how their endorsement of the president relates to their faith. Paul Bayes, the bishop of Liverpool, said “self-styled evangelicals” risked bringing the word evangelical into disrepute, and added there was no justification for Christians contradicting God’s teaching to protect the poor and the weak. Bayes told the Guardian: “Some of the things that have been said by religious leaders seem to collude with a system that marginalises the poor, a system which builds walls instead of bridges, a system which says people on the margins of society should be excluded, a system which says we’re not welcoming people any more into our country. He said he regretted that “people who call themselves evangelical in the US seem to be uncritically accepting” positions taken by Trump and his allies. “Some quite significant so-called evangelical leaders are uncritically supporting people in ways that imply they are colluding or playing down the seriousness of things which in other parts of their lives [they] would see as really important,” Bayes added. He stressed that not all evangelicals were Trump supporters, saying there were “many, many Christians who are trying to proclaim the gospel as we’ve received it, even if that means political leaders have to be challenged”. Last month, Justin Welby, the archbishop of Canterbury, said he could not comprehend the strength of support for Trump among conservative evangelicals in the US. “I really genuinely do not understand where that is coming from,” he told ITV’s Peston on Sunday programme. In his Christmas Day sermon at Canterbury Cathedral, Welby criticised “populist leaders that deceive” their people, in comments interpreted as being aimed at Trump. According to the Washington-based Pew Research Center, 80% of self-identified white evangelical Christians said they voted for Trump in the 2016 election, and three-quarters have since said they approve of his presidency. Bayes, who has been bishop of Liverpool since 2014, said: “If people want to support rightwing populism anywhere in the world, they are free to do so. The question is, how are they going to relate that to their Christian faith? Bayes was speaking to mark the launch of a new Christian charity, which he is chairing, aimed at eliminating discrimination based on sexuality or gender. The Ozanne Foundation will work with religious organisations around the world on LGBTI, gender and sexuality issues, as well as conflict resolution and education. It will be led by Jayne Ozanne, a prominent campaigner for equality within the C of E. Along with Bayes, the charity’s trustees and advisers include David Ison, the dean of St Paul’s Cathedral, Jeffrey John, the dean of St Albans, and Martyn Percy, the dean of Christ Church, Oxford. Bayes has previously called for far-reaching change in C of E attitudes to LGBTI people, saying he had been “profoundly changed” by encounters with lesbian and gay Christians, including within his own family. “I have come to believe that we need to change the church,” he said last year. The church’s “institutional inertia” needed to be countered, Bayes added. “There is no doubt that the church at the moment is on a journey, and that journey needs to arrive at a place of inclusion further on than we are at the moment. Feature originally seen on The Guardian.